The cheapest and easiest way to do the famous Einstein-Podolsky-Rosen experiment. Quantum-entanglement experiments are not exactly something you can buy in the science kit aisle at Toys ’R Us. The cheapest kit I know of is a marvel of miniaturization, but still costs 20,000 euros. In the past month, though, I’ve put together a crude version for just a few hundred dollars. It’s unbelievably simple—so simple that it barely works, let alone produce reliable results. But the thought of observing spooky action at a distance using homebrew equipment is so novel and exciting that I’d thought I’d share it with all you tinkerers, makers, hackers, and science-fair contestants. I got the idea last fall while building a supersimple cloud chamber. I was having trouble seeing particle tracks in my initial designs and wanted to check whether the radioactive materials I had scrounged really were radioactive. So I dug out a pair of Geiger counters that Aware Electronics in Wilmington, Delaware, gave me years ago for a post-9/11 review of consumer radiation detectors. Each time you hear a Geiger counter click, it has detected a single particle–which, in the case of gamma radiation, means a single high-energy photon. It struck me that the Geigers might substitute for the single-photon detectors that account for much of the cost of that €20,000 system. Doing a literature survey, I found that the very first entanglement experiment, performed by Ernst Bleuler and H.L. Bradt and independently by R.C. Hanna in 1948, used Geigers. It was the precursor of better-known work by Chien-Shiung Wu and Irving Shaknov, who reproduced the results using more sensitive detectors. In a strange twist of physics history, these researchers didn’t associate their work with entanglement per se, let alone with Einstein’s puzzlement over the phenomenon. Several years after the fact, theorists David Bohm and Yakir Aharonov realized that the experiments had breathed life into the famous EPR thought experiment of Einstein, Boris Podolsky, and Nathan Rosen. Today, physics students at Caltech, the University of Edinburgh, and elsewhere routinely perform the Wu-Shaknov experiment. But what about the rest of us who lack the resources of such august institutions? With the encouragement of David Prutchi, who practically invented the category of amateur quantum physicist, I decided to try to recreate the Bleuler-Bradt experiment in my basement workshop. The disk is rated as safe to handle, although it’s not something you’d want to carry around in your pocket. At a distance of about a foot, its emission is comparable to the background level in my basement. The gammas spray out equally in all directions. The disk is also designed to let positrons escape from one side, in case you want some. I use a short wooden dowel to block these errant particles, as well as hold the disk in place inside a plastic tube. Theory says the entangled gammas in a pair fly off in exactly opposite directions, so I look for them by placing a Geiger on either side of the sample. Paired photons should cause both Geigers to click in unison. To count these simultaneous hits, I wire the Geigers to Aware’s coincidence box (nothing more than a NAND gate, a standard electronic component), plug the c-box output into the mic jack of an iPad using a simple interface, and run an app called Geiger Bot. In pre-iOS times, Sci Am ’s Amateur Scientist columnist, Shawn Carlson, hacked a pedometer to accomplish much the same. Before hunting for entangled photons, I test the Geigers and c-box by measuring the background radiation—specifically, cosmic rays. When a high-energy particle from deep space hits Earth’s atmosphere, it shatters into a fusillade of particles, notably muons, that rain down upon the ground. A muon will rip through both Geiger counters and register as a coincidence. You can tell you’re detecting cosmic rays, rather than some other form of radiation, because the coincidence rate depends on the Geigers’ positioning. Stacked one of top of the other, the devices register particles traveling vertically downward, and Geiger Bot counts about 3 coincidences per minute. This value matches estimates of the cosmic-ray flux for such a setup. Lined up horizontally side by side, the Geigers become insensitive to muons from on high and the coincidence rate drops by a factor of 100. You used to be able to upload your results to the Cosm data-logging website, but it has shut down. Occasionally, the system also picks up spurious coincidences: two unrelated particles that just so happen to hit both Geiger counters at nearly the same time. For cosmic-ray detection, this is a non-issue; in the absence of any radioactive materials, each Geiger clicks only 20 times per minute on average, so a day might pass before both go off simultaneously by chance. 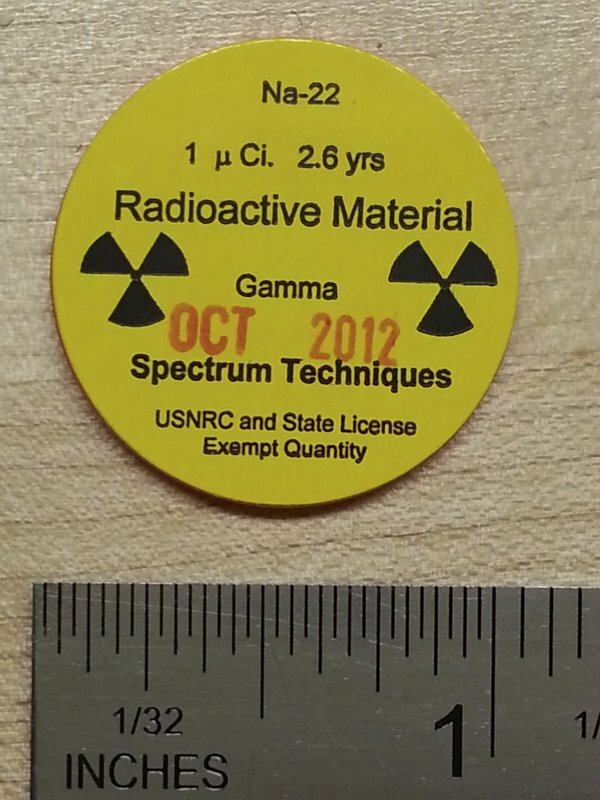 When you’re working with radioactive samples, however, the effect becomes significant, since the Geigers are clicking hundreds or thousands of times a minute. The rate of accidental coincidences scales up with the square of the Geiger readings and, in Bleuler and Bradt’s experiment, was comparable to the rate of genuine coincidences. It’s unfortunate that the two rates are similar—it means any detection of entanglement will be marginal at best. But this source of error is unavoidable when using Geiger counters. Pricier kinds of detectors have sharper time resolution and pick up fewer chance overlaps. Having tested the electronics, I’m ready to start the experiment. In the next post, I’ll describe what I found. Hi!! My 14 yo daughter is interested in trying to reproduce your experiment for our local science fair. She is fascinated with the idea of teleportation and quantum entanglement is as close as she can get. I’m willing to purchase all the components you used but am pretty nervous about her being in over her head. She’s a smart girl and very mature but once she commits to handing in the title and summary of her proposed project , she will have to see it through. Do you think an 8th grader can pull this off with enough data to present at a science fair? Thanks in advance for any insight you can share and for so generously sharing your research online. Sure, it’s definitely within her ability, although I warn you that the signal-to-noise ratio is very low, and it’s entirely possible she won’t see any discernible effect. But even doing the experiment would be educational. Let me know what happens! Thanks George. What kind of Geigers did you use? I’m finding them to range between $37-$200+. Don’t want to spend too much money but want to make sure the Geigers she uses will be effective for the experiment. I went on the Aware Electronics site but not being to saavy in this arena, I’m not sure which to order. Thanks for any insight you can share. I’m not sure it matters all that much. The main need is for a coincidence box, which triggers if both Geigers click at the same time (within some timing tolerance). It would be even better to use scintillation detectors, and you might well need to use them to achieve the necessary signal-to-noise. Who’d have thought viscous fluids would act like gravitational waves caroming off a black hole?